Original Editors - Dana Moorer & Kaelin Hocker from Bellarmine University's Pathophysiology of Complex Patient Problems project. According to Goodman and Fuller, anxiety can be defined as a heightened emotional state of concern, worry, or apprehension. It can lead to physiologic arousal causing an increase in heart rate and sweat gland activity. Dealing with occasional anxiety is normal; you may encounter anxiety when faced with an issue at work, before an upcoming exam or when making an important decision. The fear responses are important in protecting one from potential dangers but it may become maladaptive in that any contextual stimulus can become associated with recurrent fear and anxiety (i.e. generalization) When one experiences excessive worry, tension, or anxiousness on a daily basis then he/she may have a generalized anxiety disorder (GAD). Generalized Anxiety Disorder affects nearly 6.8 million American adults.The disorder comes on gradually and can begin across the life cycle, though the risk is highest between childhood and middle age Women are two times more likely to develop GAD than men. The lifetime prevalence for GAD in women is 7.7% and 4.6% in men. Other factors that correlate to an increased prevalence of GAD include being older than 24 years of age, separated, widowed, divorced, unemployed, or being a homemaker. GAD is one of the most common anxiety disorders seen by physicians and these patients are frequent users of the healthcare system. In a review article written by Katzman, titled Current Consideration in the Treatment of Generalized Anxiety Disorder, found that in a recent survey, "patients who sought help from mental health services in the past year had a 50% chance of having GAD." Patients who have been diagnosed with GAD are also at a greater risk for suicide or suicide attempts. There are many characteristics/symptoms associated with generalized anxiety disorder. Their performance in academics, athletics, etc. Anxiety disorders are often associated with depression and substance abuse. Goodman and Snyder state, "Anxiety amplifies physical symptoms." The text also states that anxiety increases muscle tension. This increase in tension can reduce blood flow and oxygen to the tissue and in turn cause a buildup of cellular metabolites. This statement demonstrates that musculoskeletal complaints (headaches, back pain, muscle tension/aches, and fatigue) can be caused by anxiety-caused tension or heightened sensitivity to pain. People who have a general anxiety disorder place an increased attention on physical and emotional pain. This increased focus can be in the form of the person noticing pain more or interpreting the pain as more significant. Goodman and Fuller state that disability, pain behaviour (limping and facial grimacing), and the seeking of medication could develop with anxiety disorders. Physical, behavioural, cognitive, and/or psychological symptoms may be present. The autonomic nervous system can refer pain to the somatic systems of the body. These symptoms include chest pain, pelvic pain, dyspnea, palpitations, paresthesia, and possible digestive, bowel, or bladder disorders. Goodman and Fuller explain that anxiety can become self-generating. This can be explained in that the symptoms of anxiety reinforce the reaction and in turn cause a 'spiral effect'. Certain items can stimulate the spiral effect and trigger anxiety disorders; these include caffeine, cocaine, or other stimulant drugs, medications containing caffeine, and even stimulants used for the treatment of asthma. It is possible that pre-existing abnormalities in amygdala- prefrontal lobe circuitry along with the hippocampus might predispose people to GAD and other anxiety disorders. According to the Mayo Clinic, GAD may be caused by brain chemicals (neurotransmitters) and their natural fluctuation. These neurotransmitters include serotonin, dopamine, and norepinephrine. There is evidence that abnormalities in GABA neurotransmission or benzodiazepine receptor function are involved in the aetiology of GAD. A relevant hormonal system is the hypothalamo-pituitary-adrenal axis (HPA), which regulates cortisol secretion. there is some evidence that GAD, like depression, is associated with excessive glucocorticoid secretion. Researchers have found that several aspects of the brain, as well as biological processes, can play a huge role in worry and anxiety. For a diagnosis of GAD, patient must have excessive anxiety and worry for 6 months, plus have three or more of the following symptoms: restlessness, fatigue, difficulty concentrating, irritability, muscle tension, or sleep disturbance. A. Excessive anxiety and worry (apprehensive expectation), occurring more days than not for at least 6 months, about a number of events or activities (such as work or school performance). D. The anxiety, worry or physical symptoms cause clinically significant distress or impairments in social, occupational, or other important areas of functioning. F. The disturbance is not better explained by another mental disorder (e.g., anxiety, or worry about having panic attacks in panic disorder, negative evaluation in social anxiety disorder [social phobia], contamination or other obsessions in obsessive-compulsive disorder, separation from attachment figures in separation anxiety disorders, reminders of traumatic events in posttraumatic stress disorder, gaining weight in anorexia nervosa, physical complaints in somatic symptom disorder, perceived appearance flaws in body dysmorphic disorder, having a serious illness in illness anxiety disorder, or the content of delusional beliefs in schizophrenia or delusional disorder. According to the article from the American Family Physician, a number of scales are available to establish a diagnosis and assess the severity of GAD. The GAD-7 has been validated as a diagnostic tool and a severity assessment scale, with a score of 10 or more having good diagnostic sensitivity and specificity. Greater GAD-7 scores correlate with more functional impairment. The scale was developed and validated based on DSM-IV criteria, but it remains clinically useful after the publication of the DSM-5 because the differences in GAD diagnostic criteria are minimal. Scoring: The total score for the 7 items can range from 0-21. Scores of 5, 10 & 15 are the cut-offs for mild, moderate and severe anxiety. Goodman and Snyder suggest that during the subjective examination of a patient, one may want to ask specific questions regarding anxiety/depression. Are you having some trouble coping with life in general and/or life's tensions? Do you feel exhausted or overwhelmed mentally or physically? Does your mind go blank or do you have trouble concentrating? Do you have trouble sleeping at night (difficulty getting to sleep, staying asleep, restless sleep, feel exhausted upon awakening)? Do you worry about finances, work, or life in general? Do you get any enjoyment in life? Do you feel keyed up or restless? On edge most of the time? Do you have a general sense of dread or unknown fears? Do you have any of these symptoms: a racing heart, dizziness, tingling and tingling, muscle or joint pains? Do you feel you are having any imbalance of yin and yang? Is your chi (internal energy) low? Comorbidities play an essential role in describing and understanding general anxiety disorders. The conditions of GAD may not be recognized as an emotional problem until the secondary disorder/ co-morbidity develops. Hoyer et al. state that epidemiological studies have found high rates of co-morbidity in GAD. Generalized anxiety disorder is most often associated with other disorders that can include other anxiety disorders, depression, and substance abuse. GAD can also lead to or worsen pre-existing conditions such as insomnia, digestive or bowel problems, headaches, and bruxism (teeth grinding). Other associated anxiety disorders can include panic disorder, phobias, obsessive-compulsive disorder (OCD), post-traumatic stress disorder (PTSD), or adjustment disorder with anxious mood (those with an organic illness). In a study of GAD in young women, Hoyer et al found that the timing of the co-morbidities can either appear later in the course of the general anxiety disorder or they may appear early in the developmental stages of the disorder. Comorbidities that may be associated with GAD include Major Depressive Disorder, Dysthymia, Specific (simple) Phobia, Social Phobia (social anxiety disorder), Agoraphobia, Panic Disorder, Mania, Substance abuse, Alcohol use/dependence, Drug abuse/dependence. The symptoms of anxiety can manifest in several ways incorporating physical, behavioural, cognitive, and psychological aspects of life. There are screening tools that can be differentiated between systemic involvement versus psychogenic symptoms. These include the McGill Pain Questionnaire, Illness Behavior Syndrome and Symptom Magnification, and Waddell's Nonorganic Signs. According to Goodman and Snyder, to help differentiate between these two sources (systemic and psychogenic) of symptoms, a series of questions can be asked of the patient. Do you feel a sense of dread or worry without cause? Do you have a fear of being in groups of people? Do you have a racing heart, unexplained dizziness, or unexpected tingling in your face or fingers? Do you wake up in the morning with your jaw clenched or feeling sore muscles and joints? Are you irritable or jumpy most of the time? Kavan, Elsasser, and Barone created a differential diagnosis table in their article titled Generalized Anxiety Disorder: Practical Assessment and Management. See Medical Management section for current use of medications to help treat GAD. When beginning a treatment program for a patient with generalized anxiety disorder many factors must be considered. These factors include patient education, patient preference, treatment success/failure history, and the patient's comorbidities. It is important to educate the patient that anxiety is a medical condition that has the ability to be managed.The patient needs to understand how his/her lifestyle and internal thoughts can play a role in the management of anxiety. The patient's preference in the treatment techniques plays a major role in the management and remission of GAD. The patient needs to engage in their treatment and must be willing to make the modification of their lifestyle and internal thoughts. A patient's comorbidities also play a role in treatment, as they might have a pre-existing disorder that can be affecting their anxiety. Anxiety can affect numerous systems throughout the body; therefore it is important to realize that the treatment of anxiety can also help with the associated disorders/pain throughout the body. There are four different guideline committees that have listed their recommendations for the treatment of patients with generalized anxiety disorder. These committees consist of the World Federation of Societies of Biological Psychiatry (2002), the British Association for Psychopharmacology (2005), the National Institute for Health and Clinical Excellence (2004), and the Canadian Psychiatric Association (2006). The focus of acute treatment for patients who experience GAD is to improve symptoms; with the primary long-term goal of remission ("the complete resolution of both symptoms and functional impairment."). Based on the guidelines for treatment from the committees, the first stage of pharmacotherapy should include an antidepressant, such as a selective serotonin reuptake inhibitor (SSRI) or a serotonin-noradrenalin reuptake inhibitor (SNRI). The two common SSRI used in the treatment of GAD include paroxetine (Paxil) and escitalopram (Lexapro). Sertraline (Zoloft) can be considered a treatment option, however, it is not currently licensed for GAD. All of these pharmacological interventions were studied in randomized, double-blinded, placebo controlled environments. As reported by Katzman, each SSRI showed effective treatment of GAD (with paroxetine demonstrating long-term treatment as well). These drugs helped patients achieve greater remission of their anxiety disorder when compared to a placebo. How they work: SSRI’s relieve symptoms by blocking the reabsorption, or reuptake, of serotonin by certain nerve cells in the brain. This leaves more serotonin available, which improves mood. An advantage to these drugs is the potential for long-term use for treatment of GAD without the worry of abuse or tolerance. Two common SNRI used in the treatment of GAD include duloxetine (Cymbalta) and venlafaxine (Effexor). The pharmacological intervention was performed on a group of subjects in a double-blind experimental study. It was found that both duloxetine and venlafaxine produced significant improvements in anxiety when compared to those who received placebo only treatment. However, it was found that adverse side effects were significantly greater in the venlafaxine group, but not found within the duloxetine group. How they work: this group of medications is for the treatment of anti-depression (and anxiety) that increases the levels of serotonin and norepinephrine. This increase is a result of the inhibition of their re-absorption into the cells within the brain. The mechanism in which this occurs is not fully understood; however, it is believed that these higher levels enhance the neurotransmission (sending of the nerve impulses) and therefore improve and elevate mood. It has been reported that SSRIs and SNRIs have "efficacy limitations, such as lack of response in many patients, a 2- to 4- week delay before the onset of symptom relief, lack of full remission, and risk of relapse." This classification of medication offers a rapid relief of anxiety symptoms for a patient. Mechanism of the action occurs by the interaction with the "receptors activated by the neuroinhibitory transmitter, GABA. In doing so, they promote binding of GABA to GABA subunit receptors (GABA A) and enhance chloride ion influx." They are not effective in resolving depression that is often associated/accompanied with GAD. These medications are highly effective in promoting relaxation and reducing muscular tension and other physical symptoms of anxiety. The generic name is referred to as Buspar. This drug is an azapirone and has been shown to be effective in the treatment of anxiety over a placebo; however, it may not be as effective as benzodiazepines. It is classified as a non-addictive, non-sedating alternative to the benzodiazepines. It is not considered a first-line treatment due to the one-to three-week delay in relief of symptoms, the short half-life (which results in dose two to three times per day), and the decreased impact on the comorbidity of depression. This drug is currently only recommended to those patients who are intolerant to SSRIs or SNRIs or who do not receive full remission from SSRIs or SNRIs. "The mechanism of action is caused by inhibition of the release of excitatory neurotransmitters" and "the onset of action occurred within the first week". In patients, this drug "has been shown to relieve psychic and somatic symptoms of anxiety" in a manner similar to benzodiazepines ( lorazepan and alprazolam) and SNRIs (venlafaxine). Beta Blockers are used to treat patients with certain heart conditions. However, this drug can also be used to help prevent the physical symptoms of certain anxiety disorders (usually a type of phobia). An example is propranolol (Inderal) is used to lower the heart rate that is often accompanied by anxiety. Physical therapists cannot directly cure anxiety, as is it thought to be caused by neurotransmitters within the brain. However physical therapists need to be aware of the symptoms of anxiety due to the fact that more and more patients are being diagnosed with generalized anxiety disorder. Based on the research, there are no specific physical therapy interventions that relate directly to GAD. Anxiety can cause many clinical symptoms that may mimic a musculoskeletal disorder including muscle tension/ muscle aches. It is important to distinguish what is the source of this muscle tension. This is when a thorough history is important in gathering the necessary information and determining if this is true within the scope of practice. An important role of a physical therapist is within patient education. It is important for the patient to understand what brings on their anxiety. Explaining that keeping a diary of their anxiety and rating it on a scale of 0-10 can be helpful for the patient. Physical therapists can also teach the patient relaxation techniques and deep breathing exercises. A physical therapist can also provide massage techniques in order to help decrease muscle tension. Another way that physical therapists can help in reducing anxiety is through exercise. Research on anxiety and exercise has shown that benefits of exercise include the reduction of anxiety and improved mood. This relationship is not clearly understood; however, it has been found that working out can help increase relaxation and keep the anxiety symptoms from returning once the patient is feeling better. According to the Mayo Clinic, exercise can help anxiety by releasing "feel-good brain chemicals (which include neurotransmitters and endorphins)." Exercise can also increase the body temperature and in turn produce calming effects. There are also psychologic and emotional benefits of exercise that include increased confidence, taking the mind of worries, increased socialization (within a gym setting), and coping in a healthy way. Aerobic exercise is best for the management of anxiety; however, any exercise to get the patient moving is a positive. Workplace physical activity and yoga programmes are associated with a significant reduction in depressive symptoms and anxiety, respectively. It is also the job of the physical therapist to refer the patient to his/her primary physician in order for the patient to have the proper medical/pharmacological management of their disorder. Cognitive Behavioral Therapy ( CBT): involves addressing the irrational thinking patterns in how patients behave and feel. In many patients, CBT has been shown to decrease the symptoms associated with GAD. CBT treatment includes numerous sessions with a trained mental health professional as well as an awareness of the principles of this therapy. According to an article written by Kavan in the American Academy of Family Physicians, "CBT addresses the role of irrational thinking in how patients feel and behave. CBT for GAD typically includes patient self-monitoring of worrying or related symptoms; cognitive restructuring, including evaluating and reconsidering interpretive and predictive thoughts/worries; relaxation training; and rehearsal of coping skills." This will in turn help patients understand the triggers of their anxiety and patterns of counterproductive thinking. In these therapy interventions, patients try to exchange the unnecessary worrying and thoughts with a more practical problem-solving approach. These patients should also incorporate self-calming techniques (including deep breathing, relaxation, and exercise) into their daily life. This will help reduce arousal and give them a sense of control over their anxiety symptoms. Stress management techniques can help people with anxiety disorders calm themselves and may enhance the effects of therapy. Some of these techniques can include deep breathing exercises, progressive muscle relaxation, and meditation. Research suggests that Mindfulness-Based Stress Reduction program (MBSR) may have a beneficial effect on anxiety symptoms in GAD, and may also improve stress reactivity and coping as measured in a laboratory stress challenge. It comprises breath-awareness, a body-scan, and gentle Hatha yoga which are used to cultivate awareness of internal present-moment experiences with an accepting, non-judgmental stance. Deep breathing- When you’re anxious, you breathe faster. This hyperventilation causes symptoms such as dizziness, breathlessness, lightheadedness, and tingly hands and feet. These physical symptoms are frightening, leading to further anxiety and panic. But by breathing deeply from the diaphragm, you can reverse these symptoms and calm yourself down. Meditation. Research shows that meditation boosts activity on the left side of the prefrontal cortex, the area of the brain responsible for feelings of serenity and joy. Other stress management techniques could include yoga, music therapy, massage, and counselling services. Also, incorporating a well-balanced diet and making sure to get adequate amounts of sleep each night can help to manage stress and anxiety. ↑ 1.0 1.1 1.2 1.3 1.4 1.5 1.6 Goodman CC, Fuller KS. Pathology: implications for the physical therapist. 3rd ed. St. Louis, MO: Elsevier Saunders; 2015. ↑ Garakani A, Mathew S, Charney DS. Neurobiology of anxiety disorders and implications for treatment. Mount Sinai Journal of Medicine. 2006 Nov 1;73(7):941-9. ↑ 5.00 5.01 5.02 5.03 5.04 5.05 5.06 5.07 5.08 5.09 5.10 5.11 5.12 Goodman CC, Snyder TEK. Differential diagnosis for physical therapists: screening for referral. 4th ed. St. Louis, MO: Saunders/Elsevier; 2007. ↑ 13.0 13.1 National Collaborating Centre for Mental Health. Generalised Anxiety Disorder in Adults: Management in Primary. Secondary and Community Care, Leicester and London, The British Psychological Society and the Royal College of Psychiatrists (NICE Clinical Guidelines, No. 113). 2011. 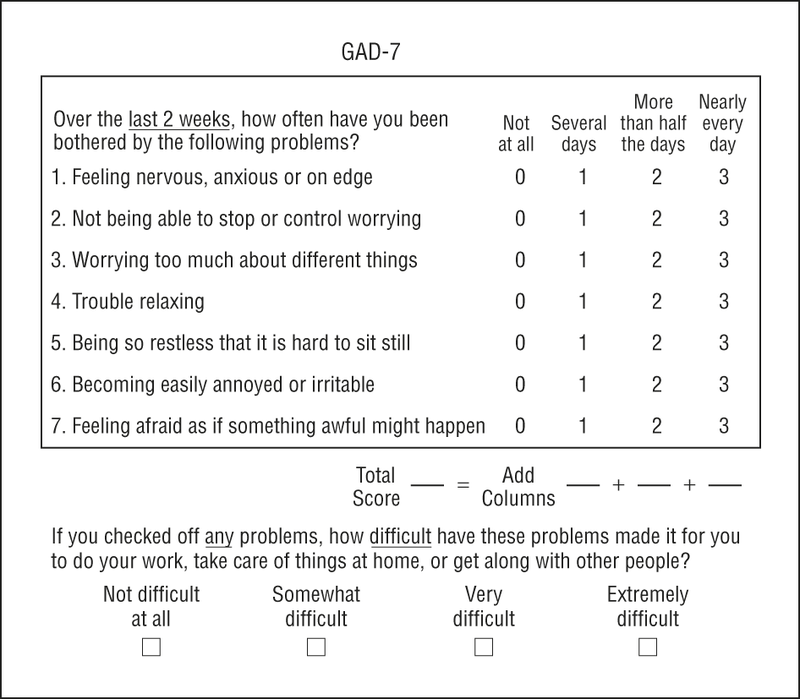 ↑ Generalised Anxiety Disorder Assessment (GAD-7) Accessed at https://patient.info/doctor/generalised-anxiety-disorder-assessment-gad-7 on 08/09/2018. ↑ 15.0 15.1 15.2 Kavan M, Elsasser G, Barone E. Generalized Anxiety Disorder: Practical Assessment and Management. American Family Physician. 2009;79: 785–91. ↑ Chu AH, Koh D, Moy FM, Müller-Riemenschneider F. Do workplace physical activity interventions improve mental health outcomes?. Occupational Medicine. 2014 May 17;64(4):235-45. ↑ Kabat-Zinn J. Mindfulness-based stress reduction. Constructivism in the Human Sciences. 2003;8(2):74.